Though I’ve said that The List of Shame posts would be more like an informal sharing of the experience of watching the film in question, I have refrained from doing so, and wrote the last posts of the feature mostly as reviews. 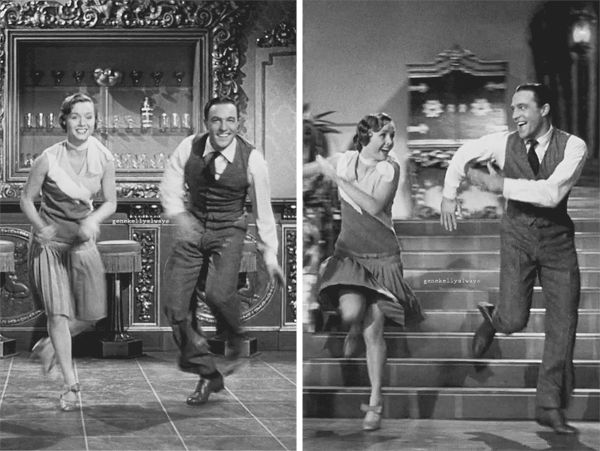 Well, the time has come to get back to sharing, for Singin’ in the Rain is not a film I can just review. I never thought I’d be agreeing with Will Schuester, but damn it if this 1950’s musical isn’t a cure for the flu. There I was yesterday, cosy in bed, shivering, sniffing, with no new episodes to watch. Just a quick glance at my movies and the decision was made: Singin’ in the Rain should be fun, uplifting. And indeed it was. It was a similar experience to watching The Wizard of Oz — expect instead of childhood nostalgia I was swooning over Gene — in the sense that it filled me with warm smiles and glee, plus a handful of good laughs (also, I finally understand the references in The Artist). I could write about its splendid use of color, the brilliant choreographs and dreamlike sequences, how unhelpful to my headaches Lisa’s voice was, or even Cyd Charisse‘s out of this world legs, but I wouldn’t be able to write much about it, and either way, I guess I just did. And the flu is nearly gone.